Walking the path of self-realization is not for the faint of heart. Drawing on a courage I didn’t know I had, I have whole-heartedly committed the past five years to my inner journey. I passed through two dark nights of the soul, one virtually on the heels of the other during my spiritual process. Deep feelings of loneliness, isolation, disconnect and sadness met me daily as I embarked on my soul journey of going from bodily identification to union with my soul. I feel I am venturing through another dark night of the soul, or perhaps more aptly named, dark night of the lower mind. But this time the experience is very different. I feel an incredible presence of love as I move through this process. Immersed in the flow of my soul, I feel a tremendous sense of connection and peace as I venture into the abyss, the void. There is deep inner knowing of this process supporting me. This death process has strong girders. Peace, authenticity and trust are my companions as I venture into what feels like a shamanic death into fallowness, where I release and let go into completion. Many shadow parts of myself are arising and I am meeting them head on as I feel my way through them. This process is found through trust. The degree to which I can trust the darker process of decent, is the degree to which I can move with grace through it knowing that I am OK. To fear death is to not live. Only by releasing and letting go can I allow new life in and be more fully in the moment. Death and her workings deepen me, allowing me to explore the parameters of my soul and unearth the parts of myself not yet healed, to find the seeds of wisdom and realization that are planted within the wounds of death. I feel called to move into fallowness, where I deepen into the ability to become dormant, still and empty. To enter my sanctuary of inner silence, where I discover the truth that is only found there. We are all Wayfinders on the path to being reunited with our true state of beingness. I now sit in awe and wonder of the journey rather than in fear of it. To enter the unknown is to gestate the void within us. Liberation rests in places unknown to us. I release, I surrender, I let go. P.S. And Open, I can now let my words flow through me. I am writing. I just wanted to say thank you for sharing so honestly. There is so much beauty in the openness from which the words arise....makes my heart all warm inside. This is wonderful Sandra - deeply encouraging and inspirational for all reading. Because everyone has to pass through this phase on the journey back to the source. A profound thanks for sharing and much loving support for your journey. Amazing and articulate sharing - and very helpful for those of us who are going through this and feel so desperately alone with it. Thank you Sandra!! Thank you Jen, Open and Cynthia for your kind words and loving support. Jen - as I have shared with you before, your willingness to be open and vulnerable in your writing has deeply touched and inspired me. Trinity recently wrote in another conversation thread, "Shows how much it can shift things when we are open and share. When something or someone touches my soul I like to give voice to that or to pass the gift onwards." These words deeply spoke to me, inviting me to bring forth and share what was wanting to be expressed. Heartfelt thanks for this wonderful sharing. In my view, it is the most important to make it clear for everyone on the path, that darkness does serve a purpose, that there is light/rebirth at the end of the tunnel and that you are never alone with your pain (however you may feel you are at the deepest of the dark night). In my case, dark night of the soul entailed by adrenal fatigue lasted for years. Open, I would be really grateful for your views on when the dark night usually happens, before or after the kundalini awakening? Or, simply there are recurring dark nights as I suspect? Or, just like anything else, is it completely different for everyone? It's a good question - when does the dark night of the soul happen? I believe it happens when people begin to move towards transfiguration - Gateway 3. Because it's when you begin to embrace the darkness within. One's own judgements of reality that create the ego, which then begins to unwind. So moving toward transfiguration, the concept of light and dark actually dissolve as they integrate inside to varying degrees of rightness - no good or evil, no absolute right and wrong - only various levels of alignment. After that though, people will of course experience karma during completion of Gateway 4. But the intensity will be different because in this phase, there's still a core knowing of one's completeness - even amidst the karma. Many thanks for you thoughts on this, Open. "And the Light shone in the darkness, and the darkness grasped it not." Sandra, It feels so liberating for you and all of us when you express so openly, honestly, and eloquently about your journey into the abyss and your rite of passage through the darkness to a higher way of being. You comments about being inspired by Trinity to share what wants to flow and be expressed is a mirror for all of us about how we co-create a higher vibration in the surrounding energy field when we dissolve our own, individual darkness that, in turn, helps others to do the same. I had lunch with a treasured friend recently whose much beloved partner passed on several years back. To date, she has been unable to share her grief. As we nibbled our food, I felt a strong urge to talk about the gradual letting go of my conditioning that led me to present a false self -- a shiny, happy self in charge and in control (yeah, right! ), about my fear of expressing my vulnerability, and about how good it feels to increasingly connect more deeply and honestly with others. Later that afternoon, as we sat at the beach, my friend's grief poured out of her as she talked at length about the trauma of her husband's sudden death. What a gift I had given her when I spoke about the beauty of connecting more deeply and honestly with others. Recently, several family members have expressed "hope" that I am well. I feel their "need" for me to be well since society, in general, views suffering and being "unwell" as a bad thing. Also, wanting me to be well reflects their empathy for my physical and emotional suffering. For the first time, I felt free to talk about what being well means to most in society and what being well now means to me: that, increasingly, I don't judge my experiences as either good or bad but rather as the experiences my highest self chooses to transcend my karma and journey Home to who I truly am. It felt wonderfully liberating to follow my heart's yearning to share more deeply in the spirit of love and respect for their own journeys -- not needing anything from them in return. Perhaps it will help them to be more honest and vulnerable in their own lives. And if not in this lifetime, perhaps in the next. As Open says, in the big picture of life we can never really hurt anyone by speaking our truth. When I first began to share articles and quotes on social media about diving into one's own darkness, it didn't feel like anyone was connecting. Rather, I got messages from friends asking if I was okay. Now when I share such articles and quotes and talk about my own journey deep down the rabbit hole, others join me in the conversation and share openly about their own darkness and suffering. Some send me private messages so we can share more deeply. All in all, it is so healing and inspiring to be part of this discussion to help shine the light into the darkness. My thanks to Sandra and everyone. Thank you Mark for asking Open this important question. Open, you have confirmed my feelings that my current dark night experience is moving me towards transitioning Gateway 2. Based on my own journey, I feel one could move through a number of dark night periods in order to release attachment to energetic layers of lower mind. Sharing my experience with dark night of the soul periods may help others to understand the process. My transition into Gateway 2 five years ago was incredibly freeing. I released much of what I believed represented happiness in my life (25 year relationship, job, possessions) to embark on an inner journey. This took the form of what I call my walkabout, I traveled mostly solo and lived abroad for 18 months. As I was preparing to purchase a business in Santa Fe NM and relocate there, my dark night of the soul arrived. It was a perfect storm. In a period of time that spanned two weeks I was delivered significant "blows" to five key stages of life transition; career/work, relationship, health, finances and role/identity. I was brought to my knees. The annihilation of my strong attachment to ego began. This brings to mind the story of Job in the bible, where he feels that everything he loves is taken away from him; his wife, his children, his farm and his way to make a living. At the onset I felt forsaken and asked the question "how and why did this happen TO me?" I dissolved into victim mentality, believing I was lost and could not survive without the things that had been taken from me. A metamorphous period ensued where aspects of my ego dissolved and I was reunited with my soul. I transitioned from "I think therefore I am". This dark night period lasted almost 2 years. My second dark night of the soul followed soon after. It was not nearly as intense, but still yielded the power for significant and necessary transformation. This phase marked the dissolve of spiritual ego. I was heavily identified with "I am spiritual" which created a split in my identity. I focused more on being spiritual than on my mind and emotions. It was a head trip that I needed to come down from. During this dark night period I started to deeply connect with my feelings and release layers of emotions. I love what you say Open about moving towards transfiguration, "the concept of light and dark actually dissolve as they integrate inside to varying degrees of rightness - no good or evil, no absolute right and wrong - only various levels of alignment." I do feel this, a departure from perceiving things as right or wrong being replaced with a feeling of alignment. Thank you Catherine for your kind words of support. You have highlighted something very important in your share in how others see us on our path of personal evolution. The lens your family and friends view suffering through is different than yours. It takes courage to stand in your truth and speak about what being well means for you. 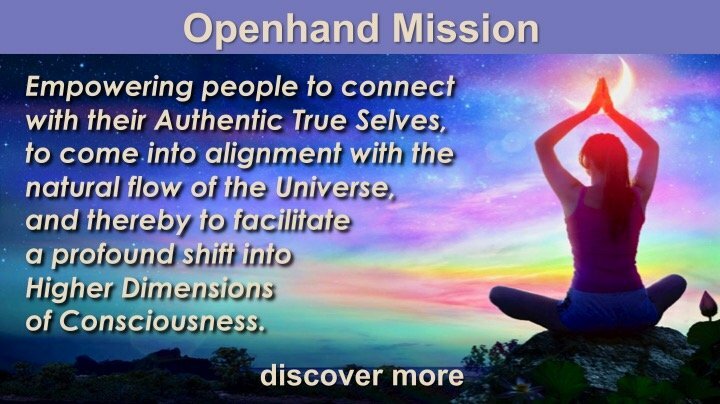 Although some of my friends and family members may not be ready to grasp the gateway transitions we Openhanders experience, I am heartened and super stoked to find that more and more folks are getting it! 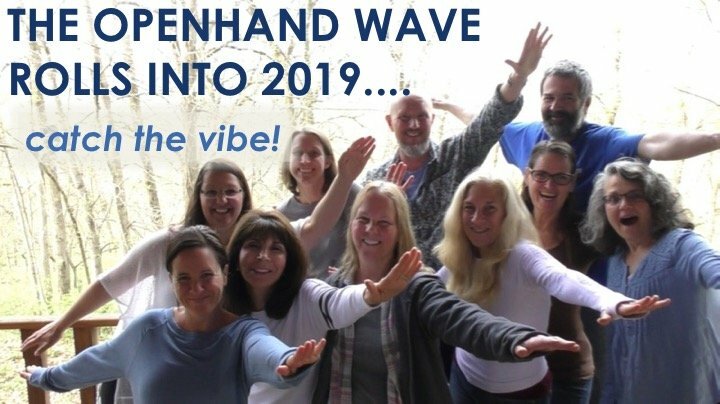 Dissolving our own individual darkness and sharing honestly and openly with others about our own journeys really does help to raise the collective vibe! This poem kind of fell out of me this morning as I was reading this thread. Thank you Sandra for the inspiration. entombed by who I thought I was. let it go, watery eyes, let it go. all my relations in milkweed and moth. go in, go through, let go. with all the other feathers. Holy Smokes, Batman! What a beautiful poem about peeling away our illusions, dissolving our darkness, and coming home to who we truly are. I've read it several times, and each time I luxuriate in your words, images, and the feelings they evoke in me. I love poetry's ability to bypass the intellect and go straight to the heart. That's what your poem does for me. Your cobra imagery is particularly powerful and for me speaks to how OC/raptor consciousness can sideswipe us and take us off our paths. As I progress with releasing my distortions, my psychic abilities are ramping up. I'm becoming more sensitive to detecting OC in my own field and in others' fields. Whenever I get close to attending an Openhand workshop, OC loves to take me off track by stirring up all my insecurities and those of my loved ones. The Victoria workshop fast approaches in November. For several months, I was feeling that I couldn't possibly attend. OC had definitely moved in. However, I have rallied, and this past week I have been doing Trinity's "Releasing Negative Entities" meditation to help me release my fears that OC loves to prey upon. So your poem is a powerful and timely reminder to remain ever present and vigilant when "the cobra weaves her smile." I love this line. For me, It so aptly captures the sly, manipulative, and insidious nature of OC as it "plays" us and those around us. Both you and Sandra have a wonderful writing talent. Thank you for your poem, Tigger. It hit the spot. The sweet spot that Open talks about. Wishing you and all of us well as we journey onwards together, riding the waves through highs and lows, joys and sorrows, light and dark times. Catherine - you express so perfectly how important it is to allow others to really "see" our journey and transformation. tigger - your poem touches me deeply. I am sitting in the resonance of your words, allowing them to weave and wander through me. Thank you for this beautiful gift. Thank you Sandra, Tigger and Catherine for your powerful sharings, I have found them very touching and beneficial. They are each superbly written in your own unique ways. Sandra, we're on our way to a higher dimension where we are completely transparent with nothing to hide. Ain't it grand?! Fiona, thank you. I often feel a cheshire cat smile when I read your postings. 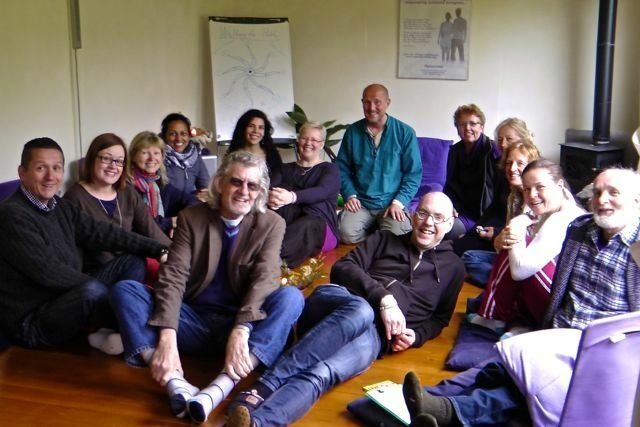 Sandra, your willingness to share the dimensionality of your journey is profoundly inspiring. Catherine, your words blew me off my toadstool. I so appreciate your enthusiasm, and always your raw honesty, peeling your own layers as you write. Excuse my ignorance, but what exactly is OC? Until yesterday, I had not written a poem in over 15 years. It wasn't that the well had dried up, I just had nothing more to say. So I laid my pen down, and picked up a camera and photography became poetry for me. Since discovering Openhand this spring, Snake has taken on new meanings for me. I have always been wary of Snake: give her a wide berth, shudder when I see one. But a short time after doing the Ascension meditation, Snake in the form of Cobra started showing up in my meditations with some powerful messages and mirrors: vulnerability, fear, being misunderstood; the need to lash out, strike, bite when threatened. I have hurled many angry words in my time that have hurt another. And it wasn't long after Snake started coming into my meditations that I had a one-on-one encounter with a black snake in the barn. She was curled up on a hay bale and was slowing consuming a chicken egg. She looked at me and I felt the gentleness of her being, I felt her vulnerability. And then she smiled. I can only describe it as a smile of being-nes, of benevolence...of transparency. 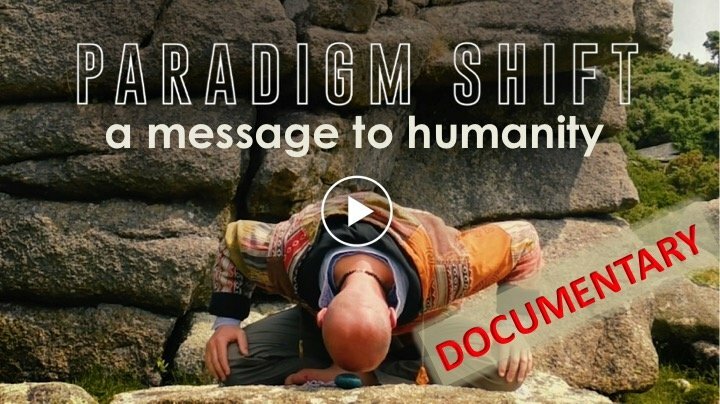 Open writes extensively about Opposing Consciousness (OC) in his books, 5 Gateways, and Divinicus: The Rise of the Divine Human. More extensively in the latter book. Essentially, Opposing Consciousness are negative entities, separated from Source, that influence our thoughts and emotions. I relate to the term "fallen angels." The only way they can hook in is through our distortions. It there's no distortion, there's no where to hook into. Most people have distortions to one degree or another, so most people likely attract negative entities into their fields. In her "Releasing Negative Entities" meditation, Trinity takes us through a process where we infuse soul into our bodyminds, tune into our distortions, feel the feelings, surrender to them, feel into whether we have invited in negative entities and where in our energy field they hook into. To release them, we accept the negative entities without judgment giving thanks that they point the way to our distortions. In this spirit of love and acceptance, we are then able to release them by cleansing our energy fields with the light of higher consciousness. We become as nothing, so OC has no place to hook into. Then they are free to return to Source. As Trinity says, "Watch as it lovingly returns home to Source." As long as we have any distortions, there is potential to re-attract them. Here is a passage from Open's article "Interdimensional Entities Influencing Daily Live" that is available on the forum. I'll attach the link to the article at the bottom of my comments. "...This Opposing Consciousness is exceptionally clever, advanced and deceiving. It works from a higher dimensional state, interacting with your thoughts and emotions. To give you an example: let's say you're taking a walk in nature, having a very peaceful, relaxing and expansive time. Yet suddenly you're thinking about work or something you have to achieve later today. Or you're in a relationship with someone and a basic misunderstanding suddenly escalates into a full blown and projectional row. Or else you're constantly worried about where your money is going to come from or how you're going to support you and your family. I put it to you that these things were not inherent to the Original Human, where we were trusting, aligned and at-one with the benevolence of the universe. Original Humans were expansive, multi-dimensional and free. And so why did these entities choose to influence humanity - what's their purpose? We can discern that by the direction of their influence, by their effects: it's to get you to live a life which is not authentic to who you are, in which case you become enslaved within the system they've created and bleed energy; which they assimilate like you would food…"
"My holy vision sees all things as pure." During my coaching sessions with Kim, I have gone into the pain of past experiences to embrace forgiveness for those who hurt me by seeing their true essence. "The Light in me sees the Light in you." I have hurled some angry words, too, Tigger. Open once said to me that behind every negative thought is a painful experience. Who amongst us has not endured pain and suffering? Here is the link to Open's article. If you want to really get into it, I recommend you read his books. They're hard to put down once you start! You made me laugh with your comment " Your words blew me off my toadstool." You really are a divine earth mother! Thank you for reminding me about Opposing Consciousness. I am aware of it, know its influence, and power. I guess I just don't ascribe much energy to it and perhaps I need to pay more attention. I have read Open's books, am now working on the new edition of Five Gateways. Catherine, your words "we are completely transparent with nothing to hide" has inspired me to share a synchronicity I experienced last month. My one month sojourn to Portland OR was a journey into deeper understanding and new experiences. I was in constant awe of the synchronicities that showed up to reveal to me a deeper truth. I walked the residential streets daily in freewheeling mode. Early in my stay I came across a small pretty envelope resting under a stuffed kermit the frog on the boulevard. It immediately caught my attention and I stopped to pick up the sealed envelope to examine it more closely. On the outside it read, Dream Mail - From The Universe To You. I opened the envelope and inside was a message affixed to a purple square of construction paper. There is a detailed image that has been gently enhanced with watercolours. It reads like a tarot card. In the forefront is an erect skeleton, positioned on a litter. To the left of the skeleton is the stump of a dead tree. To the right is a single candlestick, with a glowing flame. There are other images in the background which have meaning for me, but the part I wish to talk about is that of the skeleton. The message I immediately received from this image was: Expose yourself Sandra, expose yourself right down to your core. Trust that you will be seen, supported and carried when you express from the depths of your being (representation of the raised platform on the litter). The dead tree stump to the left of the skeleton represents the death of deep rooted conditioning and false beliefs. The candle to the right of the skeleton represents the ever-present torch that leads the way. Exposing ourselves to the bone can feel incredibly challenging. When we stand naked and wild revealing the depths of our beingness to the world, we call upon others to awaken to their layers of conditioning and illusionary stories. What a magical, synchronistic experience you had in Portland when you found dream mail from the universe with such a powerful meaning for you. I'm so with you on how challenging it can be to embrace profound self-honesty, break through and release denial and fear, and express how we truly feel from a calm and centred place. Most of us have had massive conditioning through many lifetimes that has led us to hide in fear and don masks instead to feel safe. I bought a beautiful, golden mask from an art shop a few years ago that is hanging on my wall. It reminds me to check if I've donned a false self and to be ever present to how I'm truly feeling and express from there. I don't always express honestly, and sometimes when I do express honestly, I'm not calm and centered so sometimes use "loaded" words. But I am becoming more conscious and more attentive as I let go of fears that make me want to run and hide. All in all, I feel we're all doing the best we can and that it's important to be gentle with ourselves without looking for loopholes and the easy way out! When caught reading the Bible, W.C. Fields looked up and said, "I'm looking for loopholes." ha! And yes, I couldn't agree more that we are all mirrors for one another, and we see what we're ready to embrace and let go of when we pay attention (note to self). Your post and discussion here on the forum helps us to do that. Thank you, Sandra! I have no doubts that we're well on our way to becoming completely transparent and profoundly self-honest as our way of being. But in the meantime, all I can say is "Ouch!" Another quote (forgive me!) but one that captures how painful this process feels at times. That said, the good news is that we are kickass warriors. Aho! Don't worry, you're much closer to breakthrough than you might think. It's when we kind of tire of all this, when we've had enough, that's when ot becomes possible to completely let go. It sounds like you've done plenty of spiritual investigation. And because there's no breakthrough yet, then there's an inner frustration. Yes? Paradoxically, this frustration will be preventing the breakthrough. So the key now would be to let go of the efforting to awaken - let go of the struggle. Just watch the situations, feelings and emotions you're in now and totally accept them. Feel into them. Don't wish for anything else. Don't struggle for anything else. This is YOUR initiation on the threshold of awakening. This is YOUR unique story. So embrace it. Honour it. Express what that feels like in the disconnect. But all the while, witness yourself in it. Become awesomely okay in it. You'll tire of the struggle at some point. That's when the internal letting go can happen which will precipitate the awakening. Don't worry, you're much closer than you think. PS: If you would like my help working on the process, I suggest you engage yourself in the way I've suggested for the next few weeks/months, then when you feel you've completely accepted where you're at, with as little resistance as possible, yet observing yourself in everything, then we can look at the next step. Thanks very much for your last post on this thread, Marie-Lou. I identify with your story so much. I had my first experience of pre-awakening (as per the Openhand model) in 2004, & haven't yet experienced a full awakening, at least as described by others in this community. There have been many times when I have been striving for such an awakening, & getting frustrated that I am not "achieving" it yet, feeling envious of others like Open & Trinity. Now I'm much more accepting of where I am at, & realise that I may have further layers of karma or other "obstacles" to address before I am truly ready to let go of everything, & be free to pass through the first gateway. One thing that helps me with this is to remember all the fun, excitement & positive experiences of being on the journey between pre-awakening & the first gateway. I've had some amazing times & spiritual experiences all over the world, with different people & groups, & sometimes on my own too. Everything is happening perfectly for my highest divine good. All my emotions are acceptable to myself & to the Universe. I am healing, growing & changing. There is time & space for everything I want/need to do. Thanks also to Open for his last post on this thread, which I found helpful, supportive & reassuring. With many blessings for your journey. I don't wish to sound particularly contradictory because I feel supportive to your process aswell, but I also think it's important to be really clear about what the Openhand Approach to this is. The trouble with affirmations, is that they tend to distance oneself from the true feeling of the moment - the truth of the moment, as it really is. In so doing, they can create separation (inside) rather than remove it. You're being an identity doing something, rather than being something. I've witnessed this in Buddhism for example, where people 'practice compassion'. But it becomes a doing of compassion, rather than an opening where compassion naturally arises through. It just creates another layer of identity - another ego through which to break. So acceptance for example can become an intellectual idea of acceptance which then prevents one truly feeling into the full depth of the experience itself. In this approach, that's the only way to become as-one with the feeling, and therefore "the One" through it. So true acceptance which genuinely breaks down the barriers of separation to reality - and therefore the breaking down of identity - means not to try to change or 'write over' the experience with something more desirable or positive. Who would be desiring that? (almost always a conditioned identity which can't accept reality as it is). Rather it is to allow oneself to feel the fullness of the moment, progressively without resistance to it, whatever that is. Only then can you become as-one within the experience. Which then breaks down identity, and with that separation, thus leading to an awakening. Which means interconnectivity with reality - not separation from it. Thank you for sharing with us you're feelings and experiences with respect to your spiritual process. It's lovely to meet you Marie-Lou and to connect again Alex. I was never one to use affirmations, they just didn't "feel" true earlier on my path. 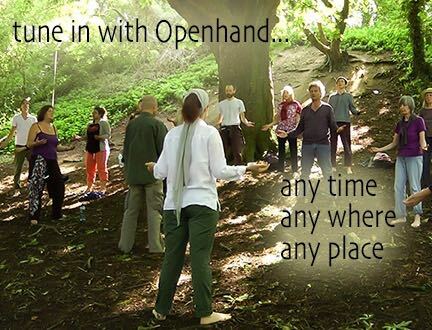 As Open points out, the Openhand Approach is very much about feeling your way through your experiences. I recall a number of years ago attending a workshop where "repeat after me" and affirmations were the core teaching. As I was being guided to use words intended to reprogram my thought process I started to feel very uncomfortable. In drawing my attention to how I was feeling while parroting the prescribed affirmations, I could sense a strong dissonance in my body. At first I thought my ego was resisting, but as I remained with the feeling I aligned with a deeper truth, one which revealed to me that the words I was being asked to speak actually felt like imposters. Another thing I recall doing that greatly impacted my awakening was pulling back from the myriad of books I was reading and workshop participation...um.....addiction. I was a workshop junkie at pre-awakening. There can be so much efforting and striving outside of one's self at the onset of the spiritual journey. I starting working with a one-to-one mentor and trusted the unfolding wisdom within my heart. I posted this lovely quote on my Facebook page yesterday and I feel called to share it here. Be More or Work It All Out. messy wonder that was her life. messy wonder that was her life." "It doesn't interest me what planets are squaring your moon. I want to know if you have touched the centre of your own sorrow, if you have been opened by life's betrayals or have become shrivelled and closed from fear of further pain. I want to know if you can sit with pain, mine or your own, without moving to hide it, or fade it, or fix it." :) Marie-Lou and Alex I feel both of you very well, I have only been practicing this for over 1 year so I am really new to all this, Intellectually I understand very well,I have had one touch of the Soul that was very powerful and lasted only few seconds, a few minor ones since but as you both say I cannot fully relate to all the beautiful sharings of experiences on the forum by all the beautiful souls.